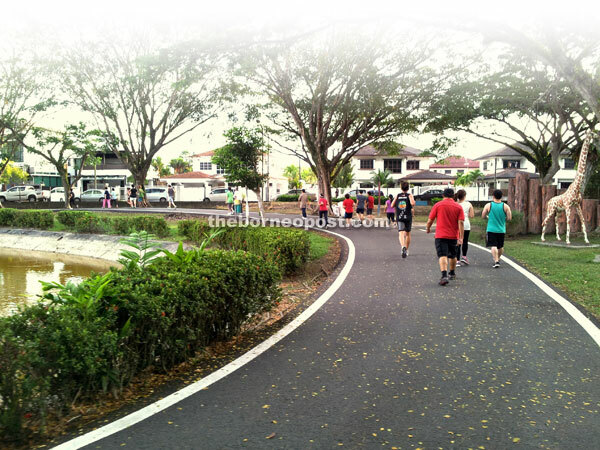 Young and old start coming back to the forgotten recreation park for evening jog, stroll or even feeding the fish. Missing planks can cause injury should visitors miss a step. A reflection of the clock tower under the evening sun makes the park more mesmerising than usual. It is time for the city council to take note of the problems at the public facility to return it to its former glory, if not better. The dry ‘water fountain’ gives way to algae. Broken chairs are found everywhere at the 24-year old Bulatan Park. Ironically, the billboard with the message ‘Love and Treasure Our Park, Cleaner Environment Healthier You’ still stands at the park. 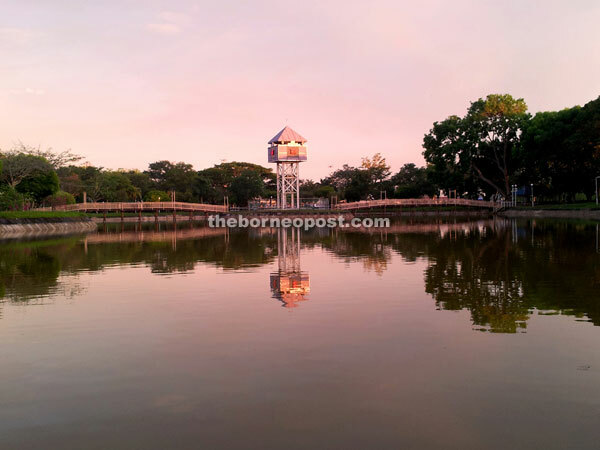 MIRI: Young people jogging on the tracks, children enjoying themselves at the playground and senior citizens sitting side-by-side with their friends while feeding the fish in the man-made lake with bread is a usual scene at the Bulatan Park Miri on a typical weekend. What many do not realise is that the water in the lake is heavily polluted with layers of grease, fallen leaves are not swept away, the watch platform is seriously damaged which poses danger to whoever dares to step on it and the Clock Tower seems ready to retire for good. 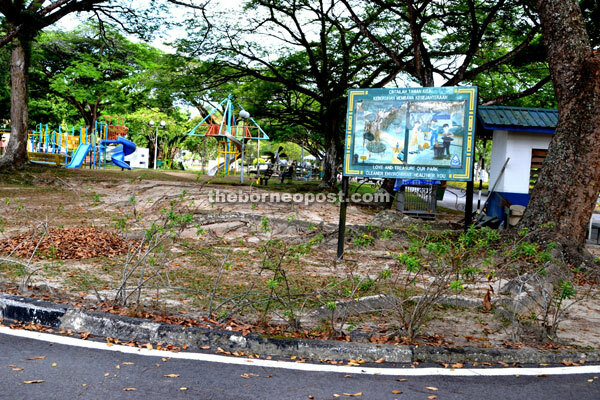 Constructed in early 1990 and opened to the public three years later, the Miri Bulatan Park is probably the earliest recreation park built here. Aside from the man-made lake and a jogging track, it also incorporates a traffic garden where Traffic Games are held every year. 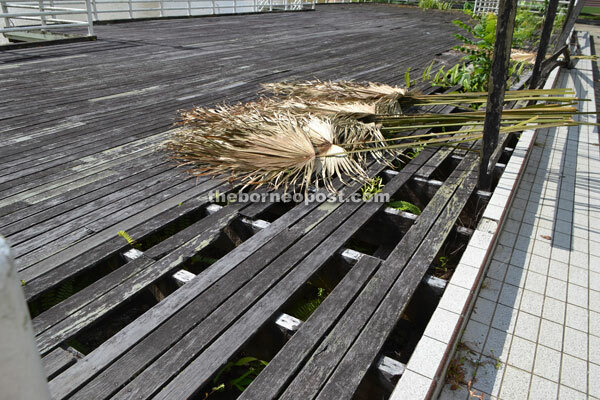 “The sorry state of the recreation park is not only a concern to us as Mirians – it breaks our heart to see little maintenance done to keep it,” a local who has fond memories of the park told The Borneo Post. 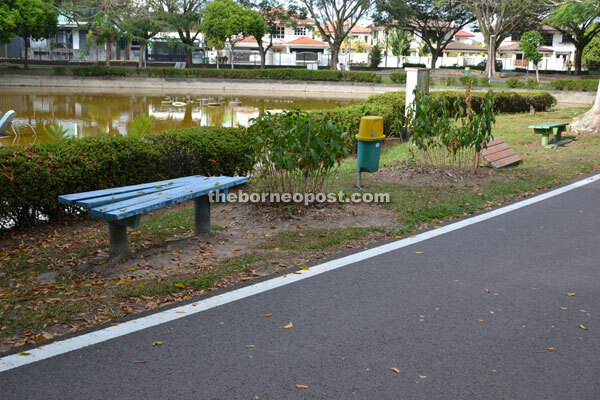 A check by The Borneo Post around the park found that besides the jogging track which was tar-sealed last year several months before the 13th general election, there was not much done to beautify the place. With faded signboards, broken chairs that pose risk to those unaware and tree roots overgrowing the tiles and cements, it is actually hard not to notice the ugly scenes. 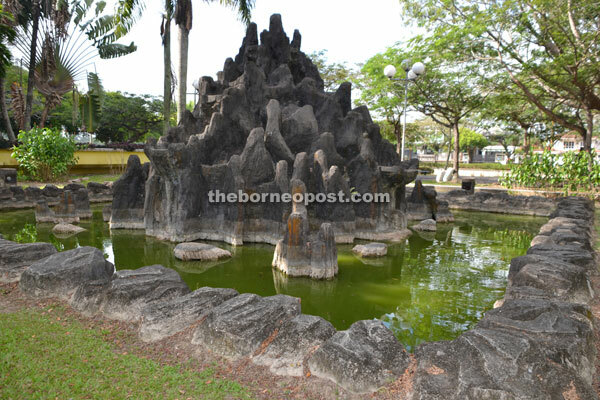 “As far as I can remember, a decade after the Bulatan Park was open, its popularity plummeted, people did not come back, which I believe is due to several reasons,” a member of the public who wished to remain anonymous told The Borneo Post. He recalled that during the early days, the man-made lake was very popular for its swan boat service. “Now that the service has stopped and the watch platform no longer used, it has become a forgotten place,” he said. He also recalled that circa 2008, a philanthropist released some 10,000 fish worth about RM10,000 into the pond. “Thereafter, it was noticed that the public started coming back, especially on weekends for jogging, strolling or feeding the fish. Children love the fishes and hopefully adults will continue to encourage their children to do so. After all, there is no harm in practising such healthy lifestyle,” he said. A keen jogger, who preferred to be known only as Louis, lamented that not only the facilities were badly damaged, the low level of security at the place meant car break-ins and theft were a huge problem. “Besides parking within the park’s compound, rows of vehicles are parked outside the Bulatan Park. Newcomers probably would leave their belongings in their cars which gives criminals the golden opportunity to commit crime. “Unfixed broken street lamps cause the place to be ghostly; the crowd usually leaves after 7pm. Only male joggers who are brave enough remain there to continue their exercise,” he said. To improve the situation, Louis suggested that the city council seriously look into the matter and engage a more responsible security company to patrol the area. He also said the city council should hear the voices of the people and return the place to its former glory, if not better.